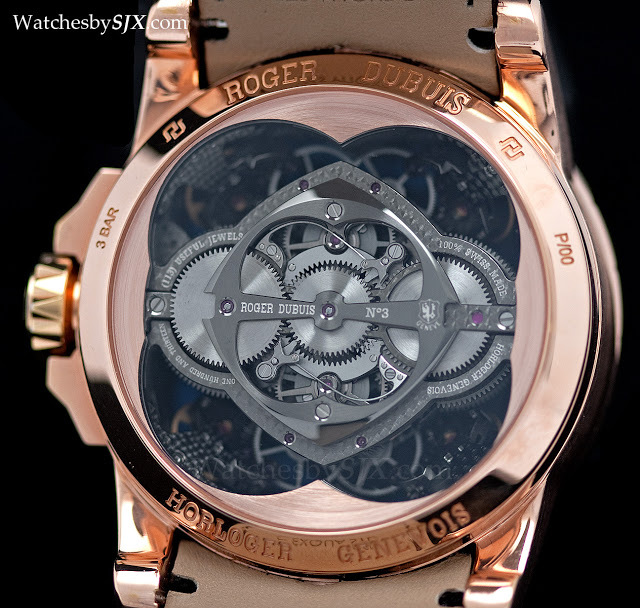 Since its acquisition by Richemont, Roger Dubuis made dramatic progress in product and production. Design, finishing and quality control have improved. 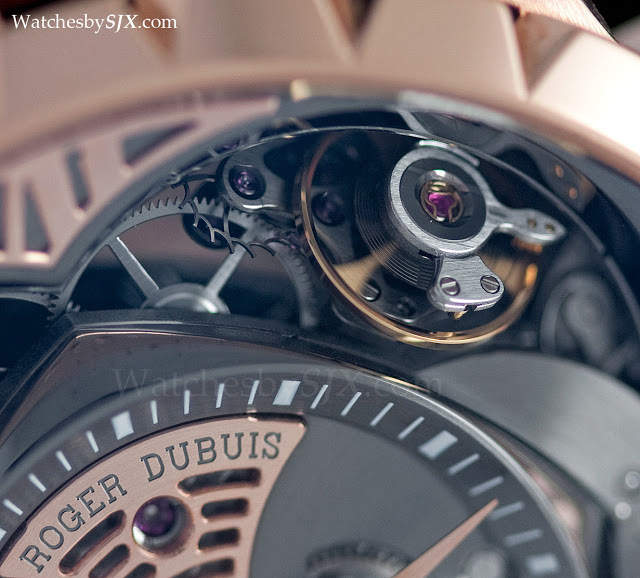 That is obvious with the 2013 collection, for it is the first year that the brand has presented major and novel calibre since the Richemont takeover. 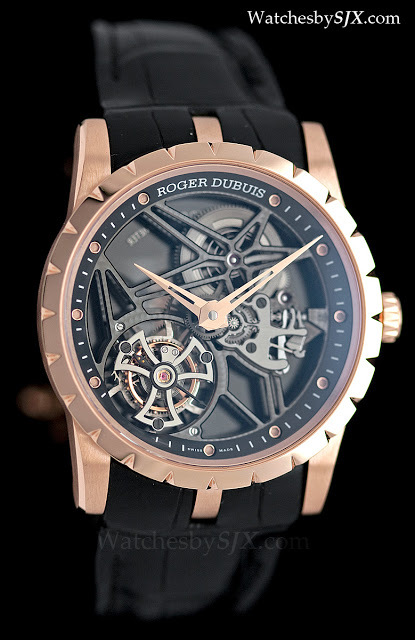 One of RD’s best selling products is the double tourbillon so the cal. 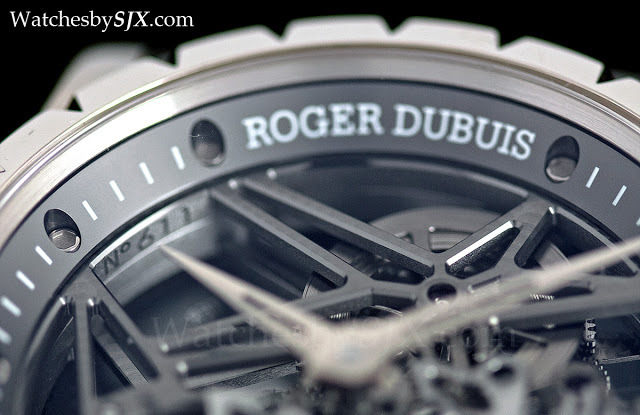 RD101 of the Excalibur Quatuor treads the same path. 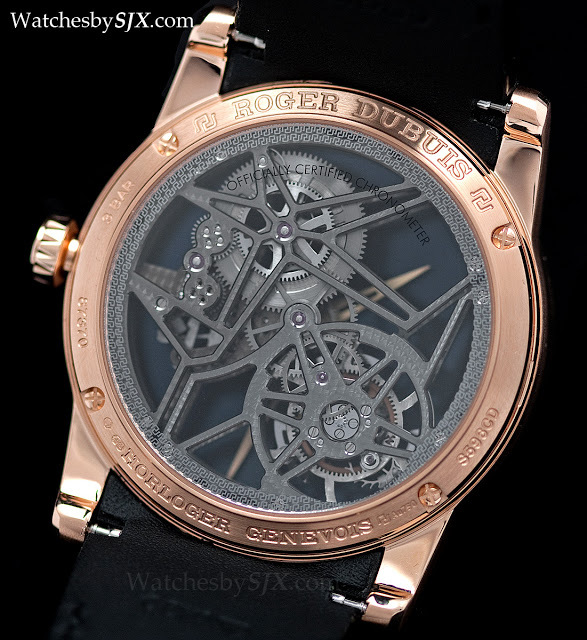 While I am not a fan of the more-is-better school of watch construction, this is interesting and fresh. 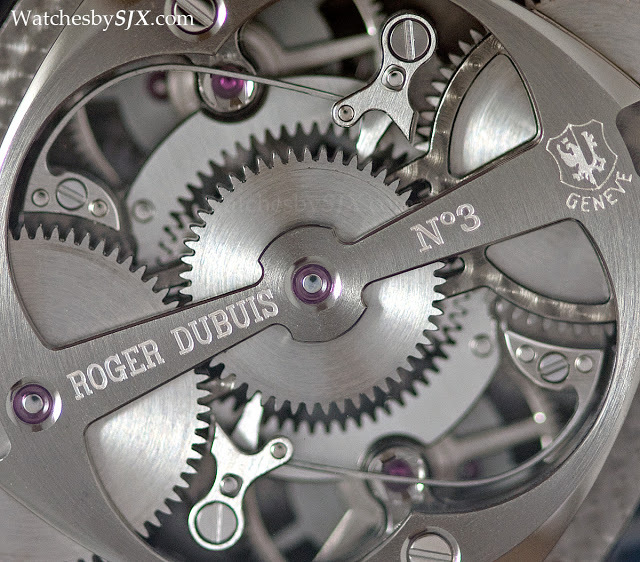 It has four balance wheels, linked in pairs, and five differentials. Each balance wheel is inclined at 45 degrees, and as I understand it each pair of balance wheels average out positional errors in rate. And then the rate of each pair is further averaged out. 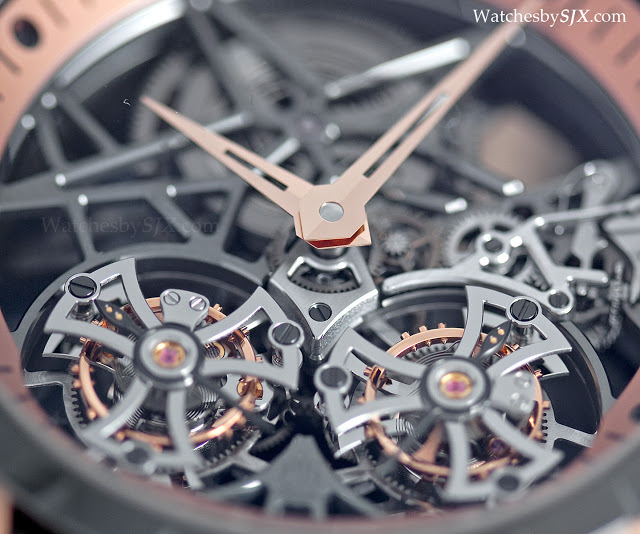 All of that means the Quatuor is a dramatic looking watch. 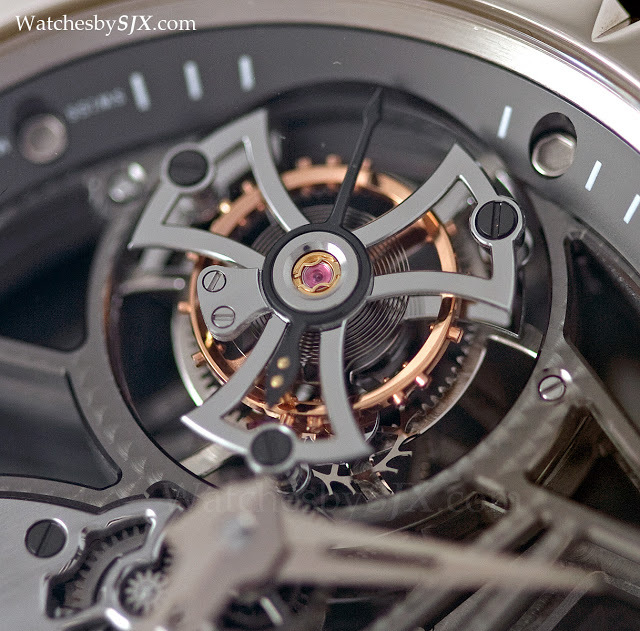 It has a 48 mm case, and plenty of action on the front – and the watch sounds like a swarm of hyperactive crickets. 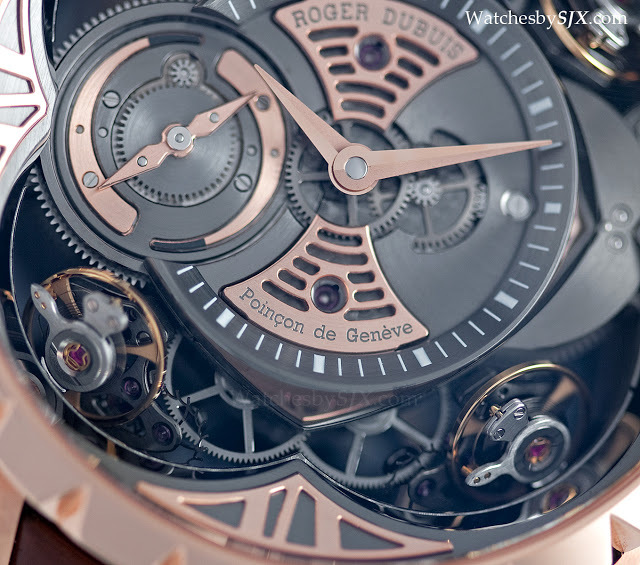 The Quatuor has the Geneva Seal and is appropriately well finished. 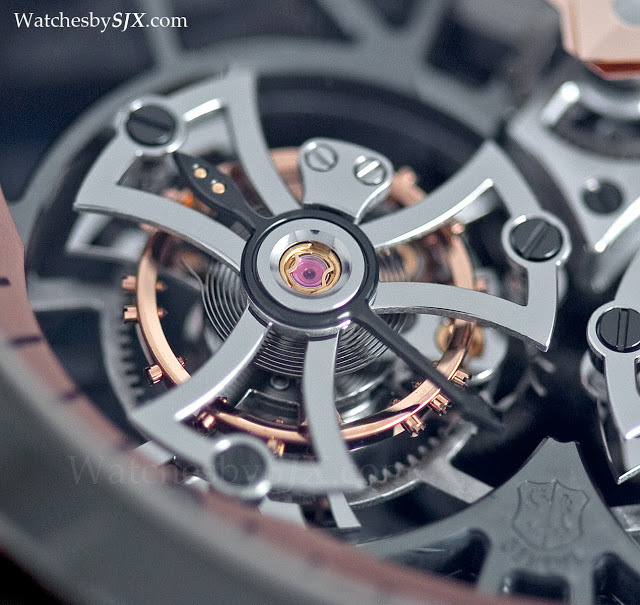 The movement layout visible from the rear is symmetrical and attractive. 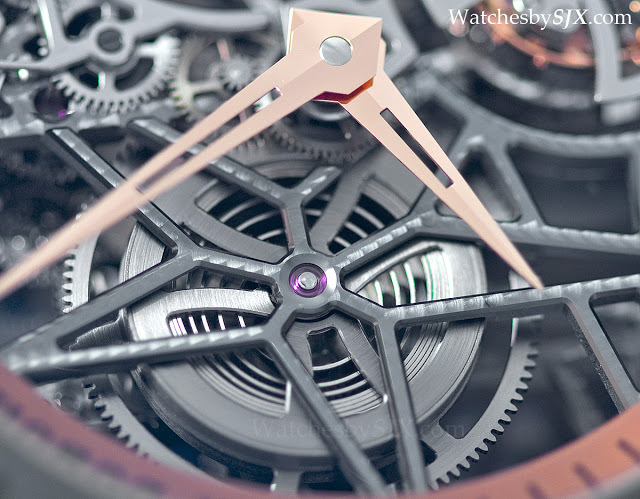 In addition to the four balance wheels, the Quatuor has an unusual power reserve display at nine o’clock, in which both the hand and sub-dial turn, similar to the Patek Philippe Nautilus ref. 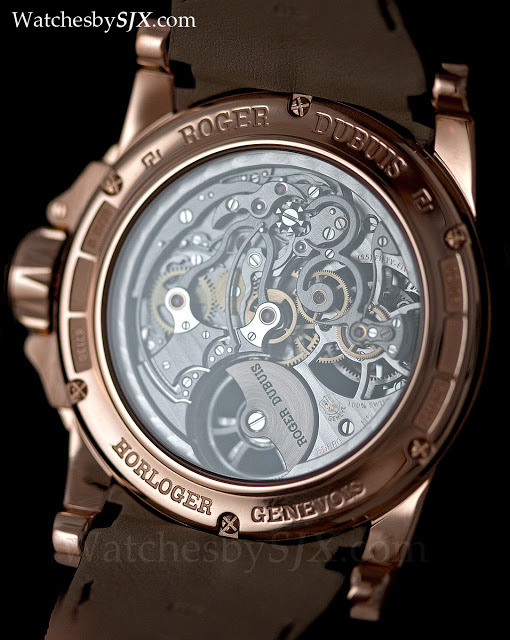 3710 with “comet” power reserve. 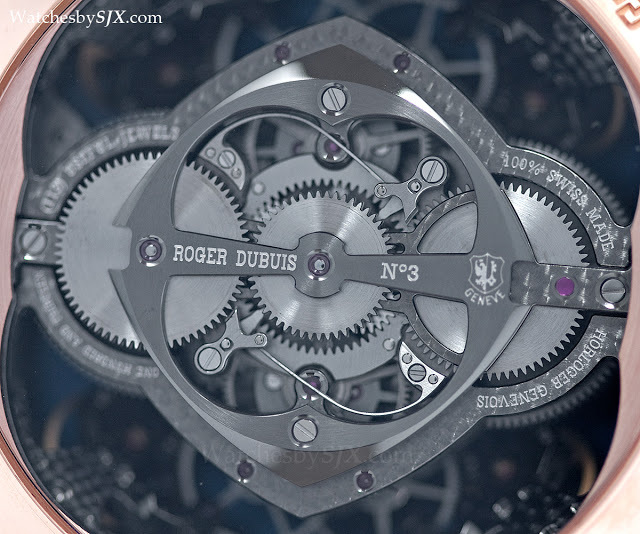 This is limited to 88 pieces in red gold, and a further three pieces in a silicon case, a world first. 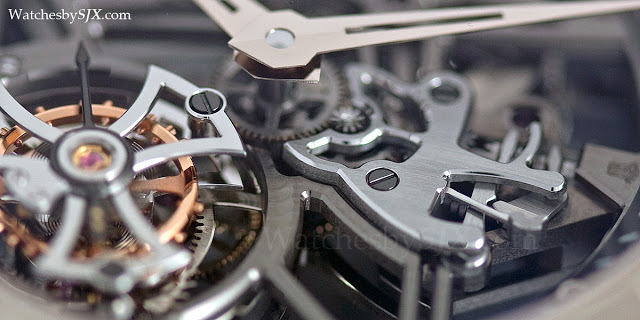 Silicon is supposed to be hard, light and everything else that all special watch case materials are supposed to be today. 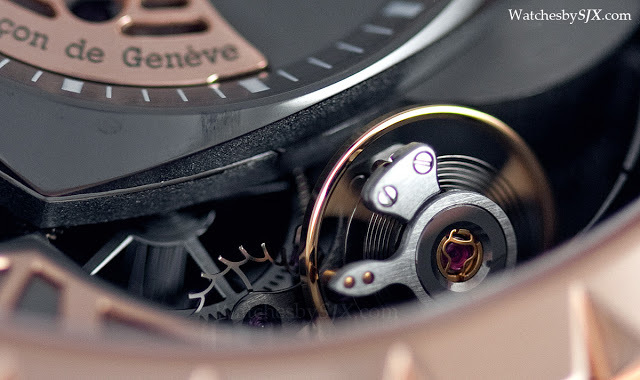 The price difference between the two is staggering – the gold Quatuor retails for about CHF380,000 while the silicon version is CHF1 million, albeit inclusive of a trip to Geneva for collection and a factory tour. 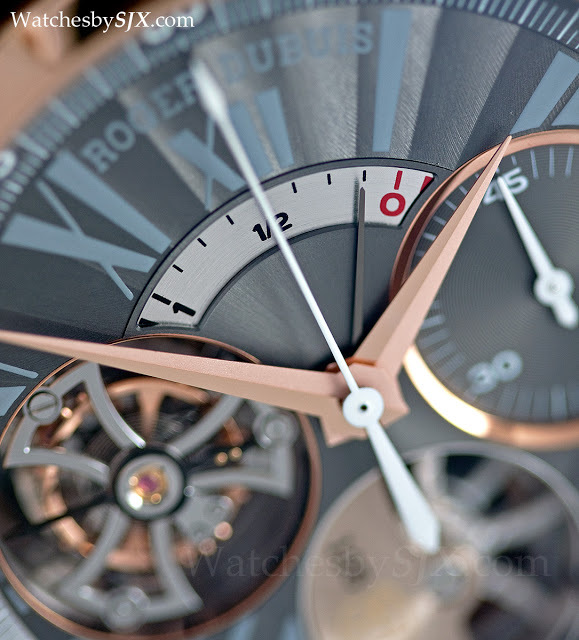 On a per-balance-wheel basis the Quatuor in rose gold certainly offers better value than the Greubel Forsey Double Balancier presented at the same fair though, since the latter is in the same ballpark for price and only has two balance wheels (strictly tongue in cheek). 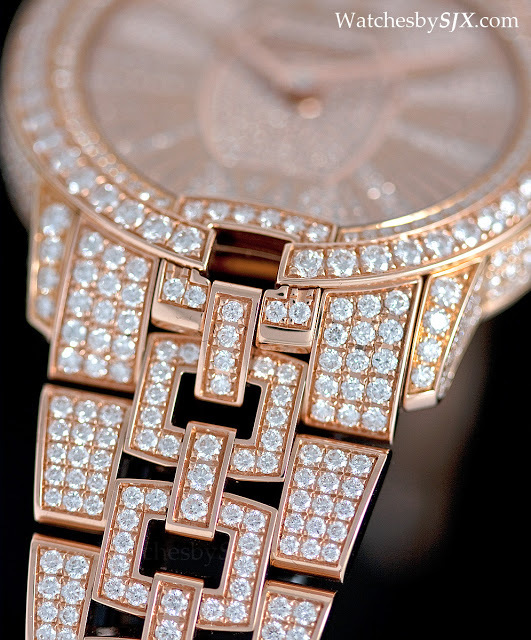 The rest of the 2013 collection comprised deft facelifts of existing models. 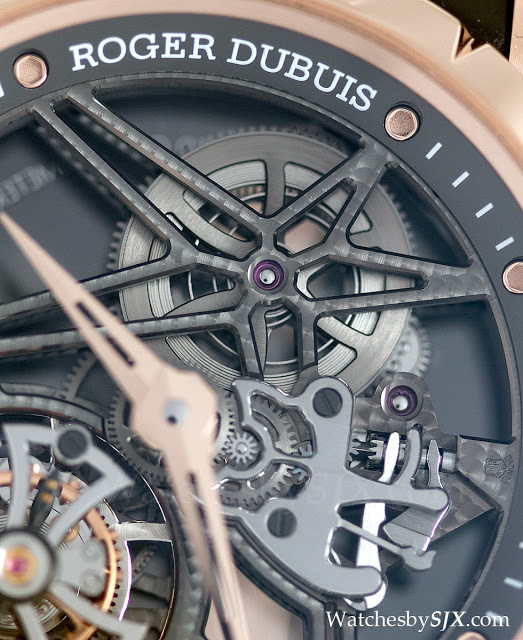 The Excalibur Skeleton Double Flying Tourbillon is now offered in rose gold with a black ceramic bezel. 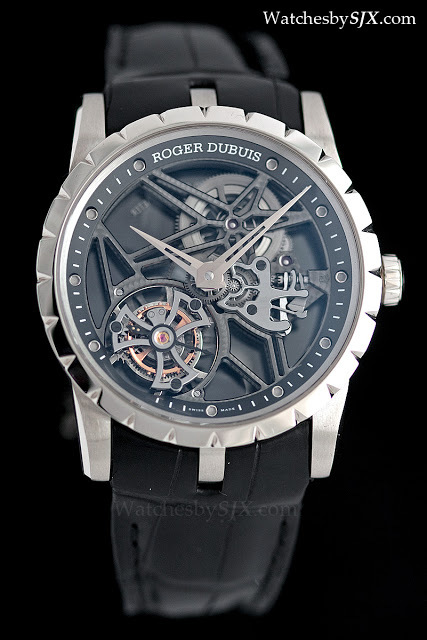 The dark bezel matches the ruthenium coating on the skeleton movement nicely. 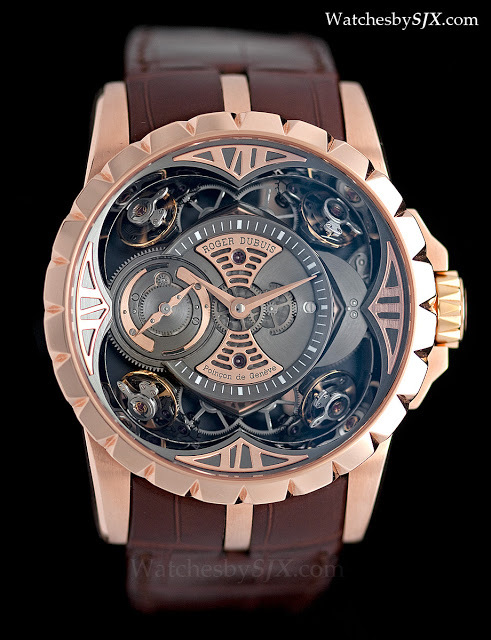 Limited to 188 pieces, this has a 45 mm case. 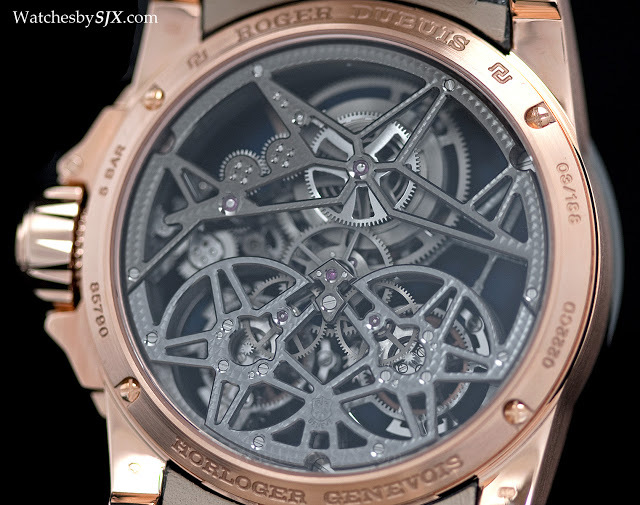 The skeleton flying tourbillon calibre has an appealing layout, with the distinctive star shaped bridge for the barrel. 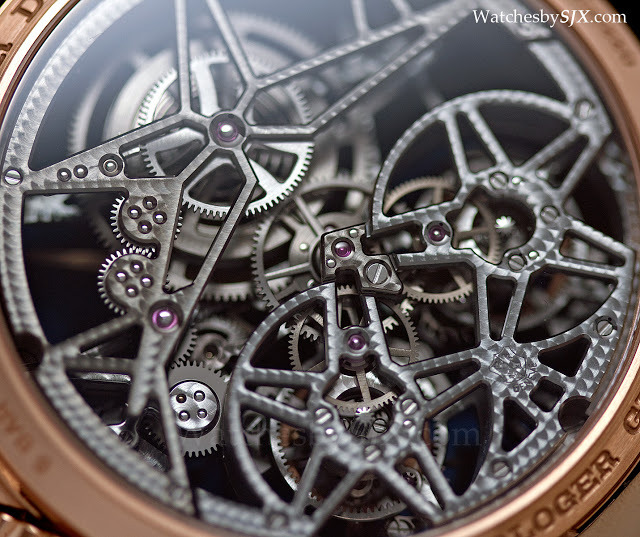 RD also uses perlage to great effect in decorating the movement – perlage is not commonly used for bridge finishing – each of the ‘pearls’ picks up the light at certain angles. 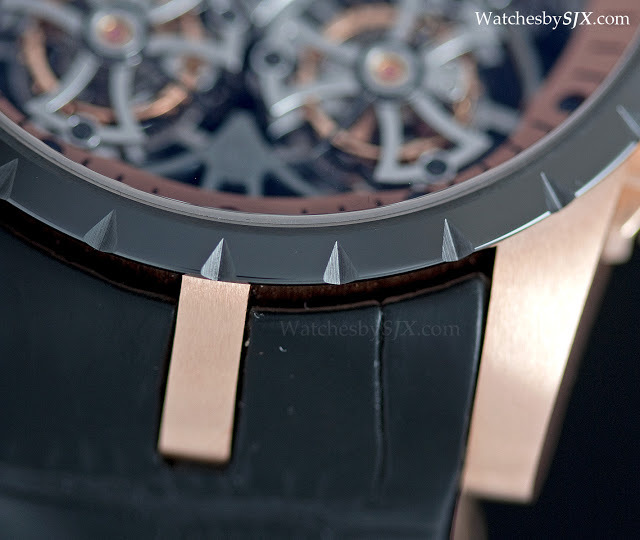 Though most of the Excalibur line is 45 mm or even bigger, 2013 sees the introduction of a more manageable 42 mm case size. 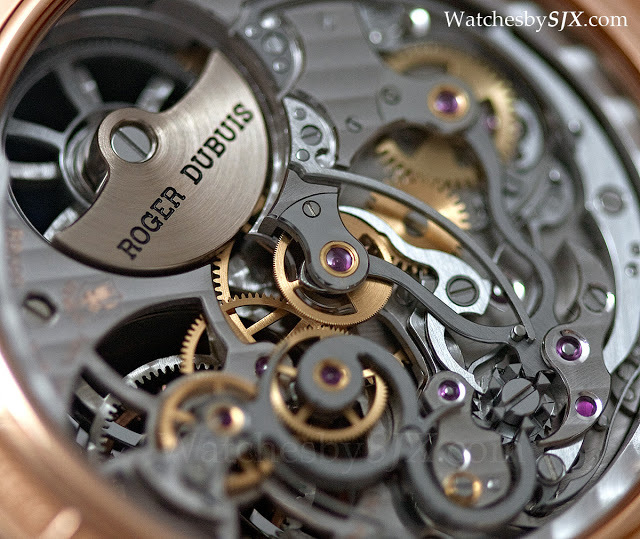 Though it retains the same styling as its larger brothers, the 42 mm case seems more elegant and refined instantly. 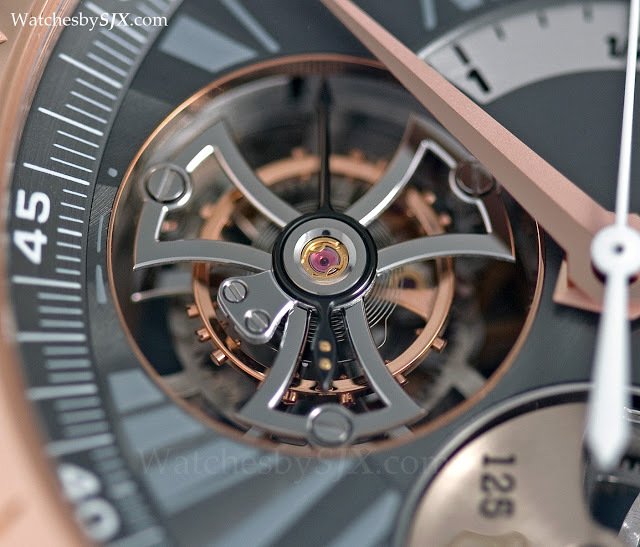 Sharing the same case as the the Excalibur 42 Chronographunveiled earlier, the Excalibur 42 Tourbillon Squelette was presented at SIHH in rose or white gold, neither of which is a limited edition. 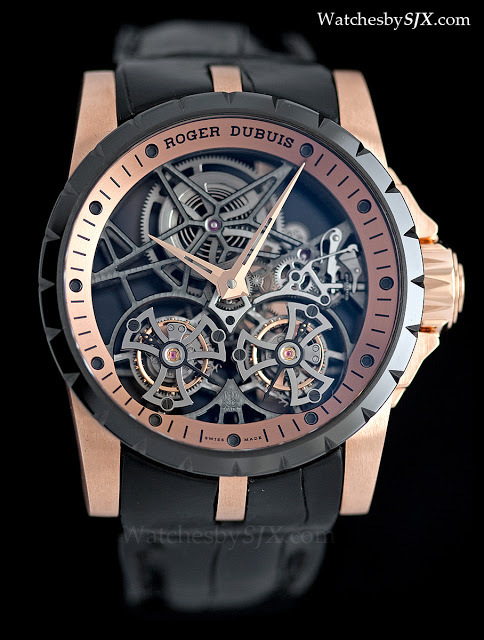 RD skeleton tourbillions have all along been extravagant and sometimes ostentatious timepieces, but this is strikingly different in feel, though the movement is identical. 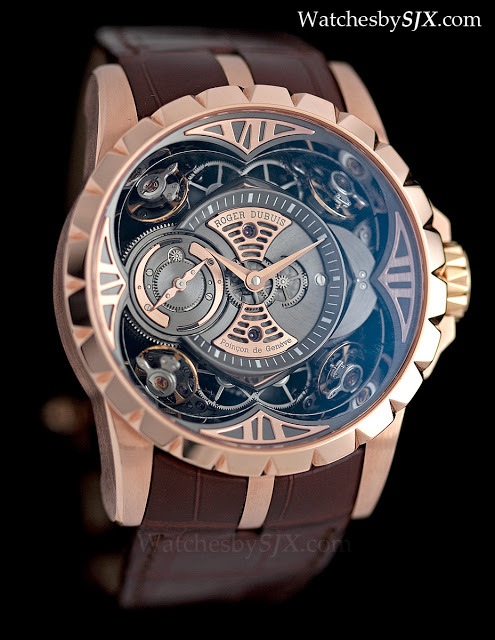 This has the same styling and finishing as the double tourbillon, with well executed perlage on the thin bridges. 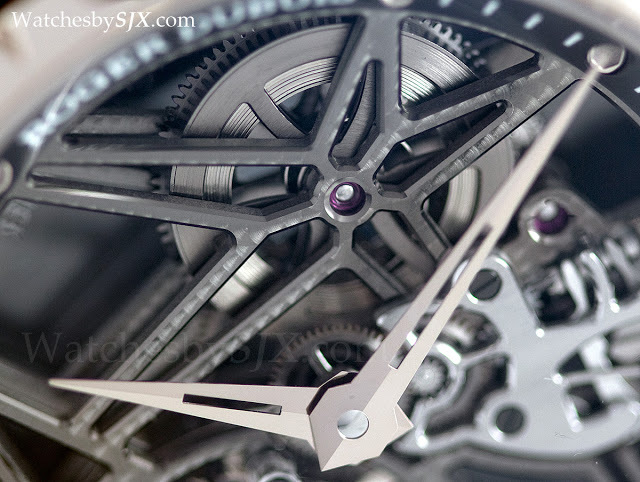 Though this was unveiled a year ago, it was redesigned and shown at SIHH this year. 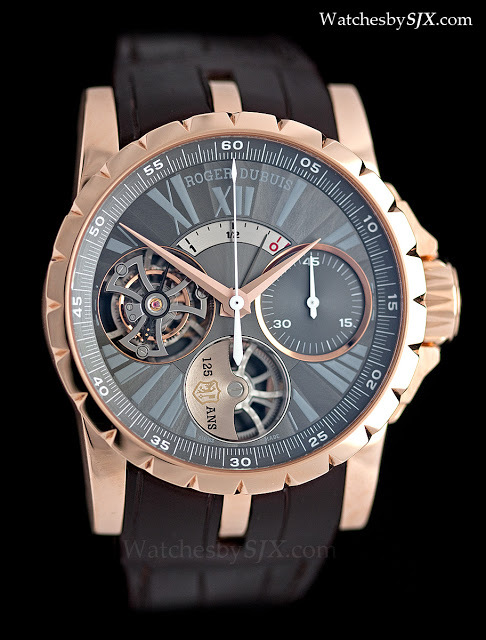 Made for the 125th anniversary of the Geneva Seal, the Excalibur Flying Tourbillon Chronograph is an automatic, monopusher chronograph with tourbillon and power reserve indicator. 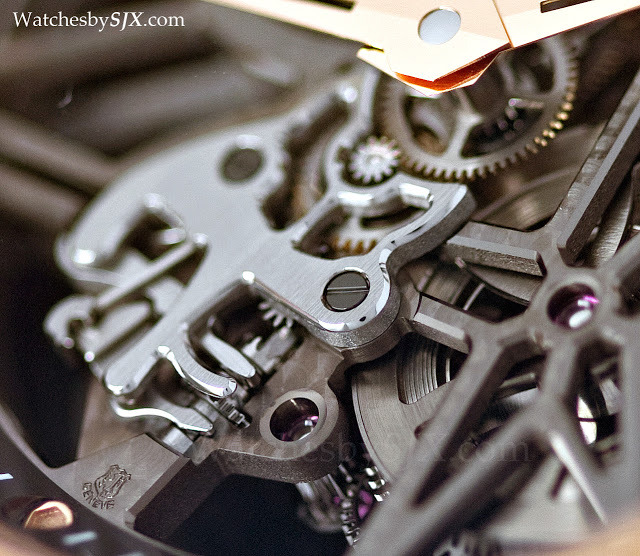 Though obviously modern, the movement has elements of classic chronograph design in the chronograph levers. 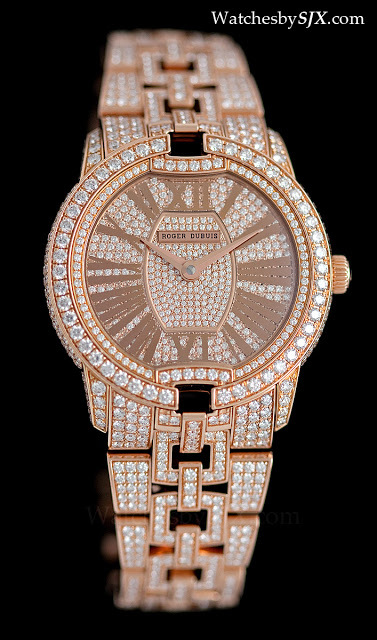 Also new for the year are variants of the Velvet ladies watch, shown here in rose gold and paved with diamonds. The bracelet of the Velvet is quite intricately constructed and beautiful, almost like a jewelled bracelet rather than a watch.